The hill Cumorah continues to yield ancient artifacts. Just this week a friend from Nauvoo, IL Daniel Lawson was exploring the hill Cumorah with his family when they came across a tree that had been recently uprooted probably from wind. Under the root ball Daniel found a large point laying out in the open. After some analysis and comparison to the style and size of other documented points found in the region next to carbon dated material it is estimated to be 3,000 years old putting it right in the timeline with the Jaredite people. This is the only Jaredite point I know of being found on or near the hill Cumorah or as the Jaredites called it the hill Ramah. 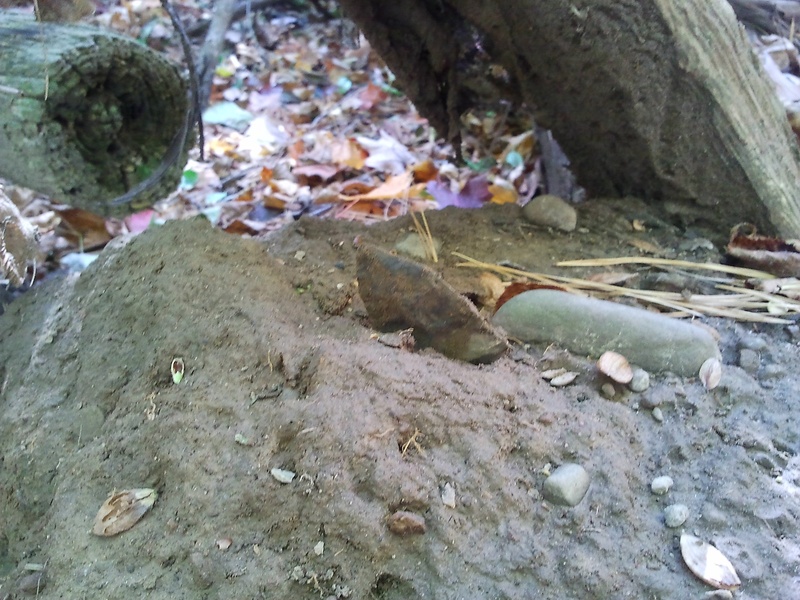 It is likely an atlatl point. An atlatl is a spear that is thrown using a throwing stick. This was the favorite weapon of the Lamanites. However the Adena people commonly associated with the Jaredites we’re a very large people. The skeletons found in North America from this time line yield bones of people 7-9 ft tall. Given the large size of some of the Jaredites, a spear to the Nephites might just be a simple arrow to the Jaredites. But until more is found on the Jeredites we’ll call this an atlatl point. This is an especially exciting find because there are fewer known artifacts from the Jaredites or as academia calls them the “Adena” people, in comparison with the Nephites or “Hopewell”. The Jaredites arrived in North America about 2300 B.C. and flourished until being wiped out after the last great battle that happened near the hill Cumorah. This atlatll point may be from that last battle of the once great Jaredite people, a story more dramatic than anything Hollywood could conjure. And especially tragic since it documents the fall of that great nation of ancient America. A cautionary tale about how pride and anger, if go unchecked, can lead to the loss of everything. Daniel Lawson will have the atlatl point on display along with other Nephite artifacts at a new museum opening this spring in Nauvoo, IL. I think that point should be donated to the Cumorah visitor’s center, it would do much good! There have been “bushel baskets” full of them from Cumorah, found by farmers that owned the hill over the years. Yes mainly on Hopewell land, but there are also many other items collected from the area , artifacts of war which are on view in the Smithsonian. Glad to see people looking in the right place instead of Meso-America. So much money and time wasted in south and central America where the Nephites did not live. I don’t look at it as time and money totally wasted, finding little to no evidence in central America is still knowledge and supports the archeology in North America profoundly. The problem comes when the researchers refuse to consider the obvious while casting aside modern revelation and scripture. I can’t blame them though. If one was given a grant to go find Nephite ruins, it would be hard to come back and say, “Sorry, didn’t find anything.” But I wouldn’t go so far as to say that the Nephites, Lamanites, Mulekites or Jaredites we’re never in Meso America. We’re talking about thousands of years of history, surely there we’re cross cultural interactions like the Book of Mormon suggests….that said, it’s clear to me where the Promised land of the Nephites is. Thanks for the thoughts. I’m sure this will strengthen many testimonies… until it’s discovered that it belonged to a group of American Indians who are of Asian descent. Then it will be forgotten just like all the other “Lamanite” discoveries. The Book of Mormon has not and will not be forgotten because it is a record of the eternal covenants God has made with people including the Native Americans. I didn’t discover this, it’s in the scriptures and validated by the spiritual manifestations millions have received through prayerful study of the book. My investigations will be forgotten by the unbelieving but the covenants we discuss and the covenant people will endure as they always have until Christ comes and personally fulfills every whit. Yeah, you and all the FLDS adherents as well. You get your truth via the same methods, but neither of you think the other is the correct religion. Awkward. As do all the FLDS members, who believe you’re not going to the highest degree of the Celestial Kingdom, nor do you believe that they are going there either in their present state of belief. Yet you use the same BoM to support your position. How does that work? Does that mean it doesn’t matter which of the two religions I follow? That’s not the Mormonism I remember. The Mormonism I remember clearly stated that you needed baptism by immersion and confirmation by one holding the priesthood. That’s why you do this in the temple for people who have died, because EVERYONE needs it. They can’t just follow any religion they want. I bring up FLDS because they do the exact same things and claim that theirs is the correct authority. The problem is that they also got their witness from God. How do you reconcile their witness from God and your witness from God? Is theirs wrong and yours right? Or is theirs right and maybe yours is wrong? Or are you both wrong together? I don’t know the priesthood line of authority for any FLDS person. I know my own line but baptism by one holding the authority is a gate, not salvation in and of itself. It’s a beginning step to get on the path toward salvation. If you want to know who has the authority, I suggest you seek wisdom from God and obtain your own witness on the matter. A sincere study of the scriptures is essential to this. The witness I’ve received or a witness someone from another church received is irrelevant to you. What’s relevant to you is that you receive a witness for yourself. If you are sincerely looking for a witness from God, I suggest you take it up with him. I can’t give you that. It comes from God. All I can say is he does answer the prayers of those sincerely seeking to know him regardless of what church they belong to. Even Joseph Smith wasn’t “Mormon” when he got his witness…. I’d suggest seeking God first and getting his direction on the matter. The Holy Ghost will testify of the truths you encounter if you seek with a sincere heart having faith in Christ. That’s great that you feel that way but that’s not what the mainstream LDS church teaches and you know it. They teach that everyone needs to gain their own witness, but if that witness says “The BoM isn’t true” or “the FLDS church has the correct authority,” then they would say, in essence, “nope, try again.” No way would a chapel Mormon say, “God has called you to join the Lutheran church? You need to follow that!” They would talk about priesthood authority, how JS was told all the other churches were not true, and how the BoM teaches how to find the only true church, etc. Actually, just last Sunday my Bishop spoke in Sacrament meeting and said he believes that “other Christian churches we’re set up by God to prepare others for the fullness of he Gospel as taught by the Book of Mormon and the Church of Jesus Christ of Latter Day Saints.” There are degrees of truth and purpose in other churches. I have a witness however, that authority and the priesthood rests on the brethren and by extension, those they call. If you want to be Lutheren, be Lutheren, My grandma was Lutheran and when she was dying of cancer, I saw she didn’t have the confidence and belief in family that would have let her peacefully slip into death. My mom searched out a better path, found the LDS church, recieved her own witness and hasn’t looked back. Her experience in the Lutheran church taught her lessons she carries with her today and has built upon with the restored Gospel. But prior to that she got a witness, while attending the Lutheran Church that Jesus is Christ. I could go on but, I get the sense that you’re trying to tear down my beliefs and validate your own bitter position rather than a sincere search to know the truth. If this is the case, nothing I say will help. So what do you say to all those people who go from Mormonism to other faiths and feel it is a better fit? They’re just misguided? You claim to be the one true church, meaning you believe that at some point, no matter what church or god a person believes in, they eventually have to become a Mormon to get to heaven. I could go on but, I get the sense that you’re not willing to consider alternative positions and you want to validate your unreasonable position rather than a sincere search to know the truth. If this is the case, nothing I say will help. Yes, I believe that the authority of the priesthood of Jesus Christ has been restored through Joseph Smith and resides in the apostolic callings of the church of Jesus Christ of Latter Day saints and no “man made reason” can refute the witness of the Holy Ghost which I have been fortunate enough to experience. That’s not to say that there isn’t truth in other churches. Many other people and churches teach truth to varying degrees. It’s not an all or nothing like you claim. If an individual wants to “smorgus board” the teachings of Christ and the doctrines revealed through his prophets, pick a little here, a little there, and leave the rest, they have the agency to do so. But be warned that if you are neither hot nor cold, he will spew thee out of his mouth. My search for truth involves asking God and he answers with authority unlike any earthy man can do. To get to heaven one must come to Jesus Christ, period. As Christ taught, one must be baptized by one having authority. So the question is who has authority? What I believe is irrelevant to you. To find out go to the scriptures including the Book of Mormon, and then go to God. If you ask with a sincere heart having faith in Christ I have every confidence that you will have the same experience I along with millions of others have had. Then you will know. And this is supposed to be validation for the Book of Mormon? And we’re supposed to be impressed or get excited over this? Actually, thousands of arrowheads and points have been found around the Hill Cumorah by farming over the last two centuries, many bushel baskets full. 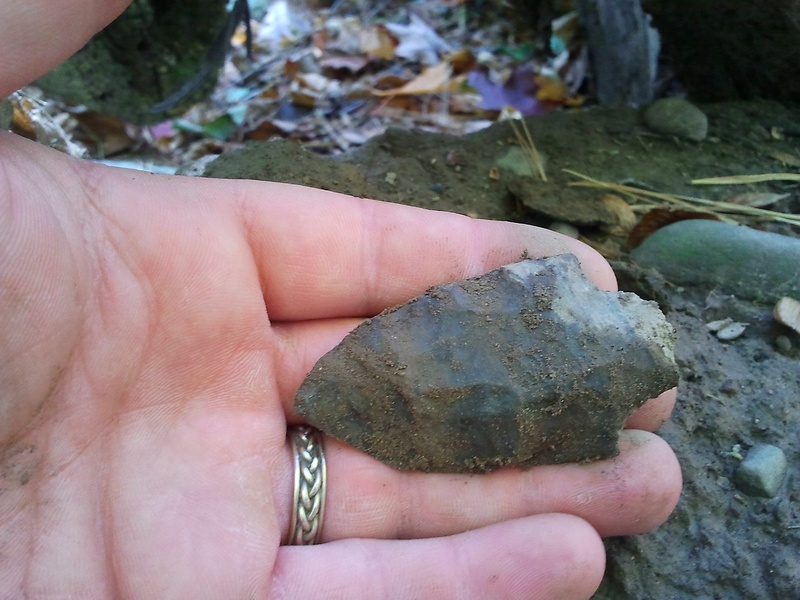 As farming only brings up the top layers of soil, I think the important element about this find is that is was deep, under the root ball of a tree, and of an older time period than the before mentioned arrowheads. The point of course, (forgive the pun), is that there were two distinct time periods a thousand years apart, where the warfare around the hill was mentioned in the Book of Mormon. OK, but the BoM claims battles of millions not thousands. My grandfather’s ranch in New Mexico also yielded thousands of arrowheads – several bushel baskets full – and it wasn’t even large enough to merit a dig. The problem remains. Well for a start evidence of smelting never goes away. Ore mining and metallurgy is a messy process and it’s remnants aren’t easily covered up or lost. The earliest evidence of metallurgy we have on the American continent only dates back to around 200BC. And the earliest evidence of weapons grade steel anywhere in the world only dates back to around 400AD and it’s in Asia NOT the American continent. At the risk of sounding snarky, your assertion is an old misnomer. I’m sorry, but as is so often the case with Mormon Archaeology, this appears to be yet another case of Mormons coming to the conclusion first and then bending the facts to fit them. There is no such thing as ‘Mormon’ archaeology, only artifacts that God allows us to find. When He does, there is just enough light in them to confirm those that want to believe, and just enough darkness to blind those that do not. There is no such thing as Book of Mormon people, just some weak parallels to real people that Joseph Smith made when he dictated the book based on popular ideas from his day. When Mormons see the parallels, they have more than enough confirmation bias to believe in their religion while, by definition, ignoring all the contradictory evidence, whereas the skeptics and the informed get to keep 10% of their income. and as they say… you are an idiot Sir! look into your life and soul as i have the feeling you have a lot of hate, you are not in peace, and you will never find it by hating others beliefs. We have found PEACE and is incredible- hope you find it too! The Hill Cumorah in New York in not the same one mentioned in The Book of Mormon . The Present day Hll in New York was never referenced as the Hill Cumorah till many, many years following Joseph Smiths death. If so then the remaining two thirds of The Book of Mormon not translated and the remainder of the thousands of other Plant would be located there too. There are no such caves, cavern or Mounds at the site. Do your homework people and pray about it and you will know the truth! ….. uh you need to watch my 4 part series on “Cumorahland” it puts to rest all the myths you talk about. Yes it was called the Hill Cumorah by Joseph Smith, Oliver Cowdery and many others durring Josephs life time, in fact they even walked INTO the hill and saw all the records on multiple occasions including the sword of Laban. Warfare and calcium from mass casualties has been well documented by James E Talmage. Metal detectors go crazy over the site. In the 1800’s smithsonian surveyor EG Squirer documented over 250 fortified hill top forts in the area and published his surveys in “Aborgiginal monmuments of Western New York” and even the local black smith in Palmyra would walk around the hill picking up ancient iron to make things from. He never needed raw material because it was all left on the ground from the battles. Like I said, watch my 4 part series “Cumorahland” …. that’s my suggested homework assignmen:).